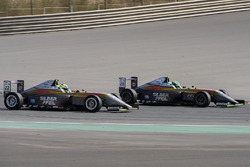 This weekend’s race was held at the Dubai Autodrome. Being my home track, I was familiar with the majority of the corners, only this time it was a different layout. Additionally, I only attended half of Thursday’s practice sessions as I had other school commitments. This meant that I was already behind my competitors, as they would have practiced Wednesday too. Jumping straight into qualifying, I wasn’t expecting a top 5 finished but just wanted to use it as more track time before the race. After going for a few hot laps I could only put myself in 9th, 8 tenths off pole position. Again knowing that I wasn’t fast enough to compete for podium positions, I was prepared for a 7th or higher place finish. But to my surprise, I overtook Lucas Roy, while my championship contestant (Weertz) and Cordeel retired from the race. This put me in a final position of 6th place, which I thought wasn’t too bad, weighing the odds. Finishing in 6th place meant that I would start on pole for this race. I felt that I was fast enough to at least put up a fight, but after a gigantic lockup in turn () and losing my wing while being in a train, meant that I had to retire, soon to realize that I could have come in and changed the wing. 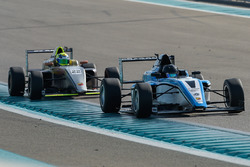 Race 4 was canceled due to a death in the Superbike category, eventually leading to the forbidding of Superbike racing at the Dubai Autodrome. I took up Kart Racing at a young age. Many days were spent playing video games at home before I finally took up racing at the age of 7 years old.